If your going to rent a Mercedes Benz for a day then the G550 Squared is a great car to experience. The G550 is already one of the most popular luxury SUV’s to rent in Miami, NYC, Vegas and Los Angeles. G wagon rental is popular because it provides a powerful, luxurious ride with an old world vintage feel. The G550 Squared is no exception, it’s raised suspension makes it the tallest luxury SUV available for rent. The king of the road is equipped with the superior all-wheel-drive powertrain and portal axles inherited from the 6×6. 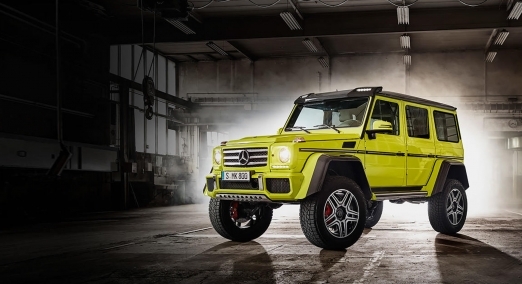 Although it does come with the same G-Class body it is equipped with a newly-developed variable chassis. Under the hood is an all-new 4.0 liter V8 bi-turbo lightweight and efficient engine with unprecedented power delivery. The newly developed eight-cylinder comes standard with twin turbochargers which are mounted on the inside of the V configuration also known as the “hot inside V”. This helps reduce exhaust emissions and provides an optimum response time. The lightweight powerhouse is composed of aluminum alloy to provide strength and keep the weight to a minimum. With the sports mode, the G 500 4×4² adjust the suspension to make you feel like your driving a sports car instead of an off-road beast. If you prefer a more subtle G-class rental then we also have the G63 and G550 rentals available in most cities. Rent the largest, meanest G-Class on the streets of Miami and Los Angeles today from Luxury Car Rental USA. Unlike any other luxury car rental experience, this is one of the most exclusive Mercedes-Benz G wagon rentals. Make a lasting impression at your next big event by renting the Mercedes G550 Squared. Our goal is to provide an effortless car rental experience. Rent this beautiful yellow Mercedes G wagon today and we can deliver it for Free to Miami International Airport or Los Angeles International Airport. The cost to rent a G 500 4×4² will depend on the time of year and availability. The average price can range between $995 and $1,295 per day. Delivery to Miami Airpot and Los Angeles Airport is free. Included in your G 500 4×4 squared rental is 100 miles and each additional mile after that will be $2.95. Drive One of the exclusive Mercedes G wagons ever produced. If you have any question regarding any one of our Mercedes rentals please feel free to give us a call. We strive to provide the easiest and quickest way to rent a luxury car anywhere you might be traveling to.